High Street is the highest fell in the area east of the Kirkstone Pass, and one of the most visited in this quiet part of the Lakes. The fell takes its name from a Roman road (see below), and its large summit has also been used as a race course and as the location of an annual shepard's meet. Despite its height High Street isn't a large fell, standing on the shoulders of lower peaks in most directions. The fell takes the general form of a north-facing triangle, with Thornthwaite Crag at the south-western corner, Mardale Ill Bell at the south-eastern corner and the Straits of Riggindale leading to The Knott and Rampsgill Head to the north. The western slopes end very quickly at Hayeswater Gill and only in the east is the fell extensive, running down a very long eastern ridge to Haweswater. From a distance High Street is normally seen as a flat plateau, but from up close the flanks are more impressive, especially to the east, where significant crags loom over Blea Water and a splendid ridge runs east down to Haweswater. Most of the routes of ascent of High Street pass over other fells on the way to the top. Here we will list the routes by starting point. From Mardale Head there are three ways to the summit. The easiest follows the path to Small Water, then to Nan Bield Pass, where we turn right to climb Mardale Ill Bell and from there continue on to High Street. The second route follows the very long ridge that starts at the Rigg on the shores of Haweswater and ends at Long Stile. The third follows one of the routes up Kidsty Howes, then the ridge to Kidsty Pike, Rampsgill Head and the Straits of Riggindale. From Kentmere there are three possible routes. Again the easiest goes to Nan Bield Pass then over Mardale Ill Bell. Alternative routes both start from Kentmere Reservoir - the first scrambles up to Lingmell End, due north of the reservoir, and from there to Mardale Ill Bell. The other heads almost to the top of the Kentmere valley then exists west towards Thornthwaite Crag, in both cases with steep climbs. From Troutbeck follow your preferred route up Thornthwaite Crag then head from there to High Street (the Park Fell route is shorter). Finally the fell can be reached from Hartsop in the valley south of Ullswater. From here follow the path towards Hayewater. Just short of the lake take the path that climbs up The Knott then cross the Straits of Riggindale to reach High Street. We visit High Street during the Kentmere Round. The top of High Street is a vast grassy sheep plateau - so large that it has been used for horse races. The plateau is roughly triangular, with the triangle pointing north. The highest point is towards the northern end of the triangle. The best views down into the surrounding valleys come from the edges of the plateau, which generally blocks the view downwards from the summit. 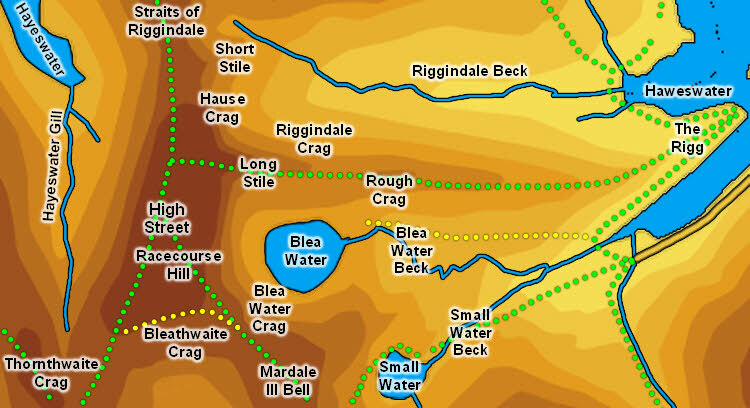 We will list the streams of High Street clockwise from the north, starting at the Straits of Riggindale. Riggindale Beck flows east from the straits, forming the divide between the long eastern ridge of High Street and Kidsty Pike. Next is Blea Water Beck, which runs out of Blea Water, and forms the boundary with Mardale Ill Bell. Blea Water Beck runs into Mardale Beck and then into Hawewater. High Street has a short footing on the lake, between Mardale Beck and Riggindale Beck. To the south the River Kent is born below Bleathwaite Crag, and flows south away from the fell. To the west Hayeswater Gill is born below the junction between Thornthwaite Crag and High Street and flows north into Hayeswater. The Straits of Riggindale sit above that lake, so this is the only named stream on the western flanks of High Street. High Street has a footing on two lakes - Hayeswater in the west and Haweswater in the east. The fell can only claim a half share in one tarn - Blea Water, which it shares with Mardale Ill Bell. The fell takes its name from its most famous, yet hard to find, feature, the Roman Road. This comes up from Troutbeck, climbs up Park Fell and crosses the eastern flank of Thornthwaite Crag and then runs along the eastern side of the large summit plateau of High Street. The road then crosses the Straits of Riggindale, before running across Rampsgill Head and north-east along High Raise, Raven Howe and Loadpot Hill. It finally leaves the high ground along the western side of Heughscar Hill heading towards Penrith. This may seem like an odd way to get from Ambleside to Penrith (and in particular the fort near Brougham, south-east of the town), but after the initial climb the gradients are fairly gentle and the fell tops would have been much drier underfoot that the valley bottoms. This is also a rather more direct route that the modern road around Ullswater.